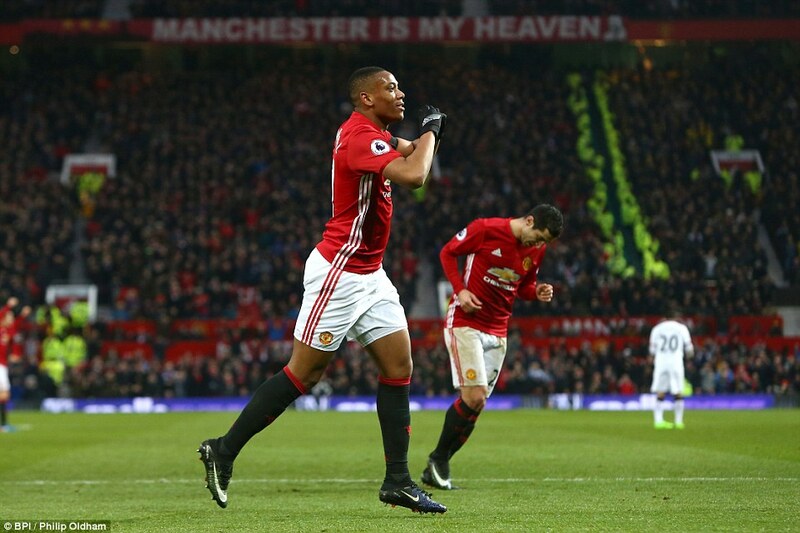 Anthony Martial scored Manchester United’s second goal and Jose Mourinho could barely contain his delight, punching the air repeatedly. It was game over. 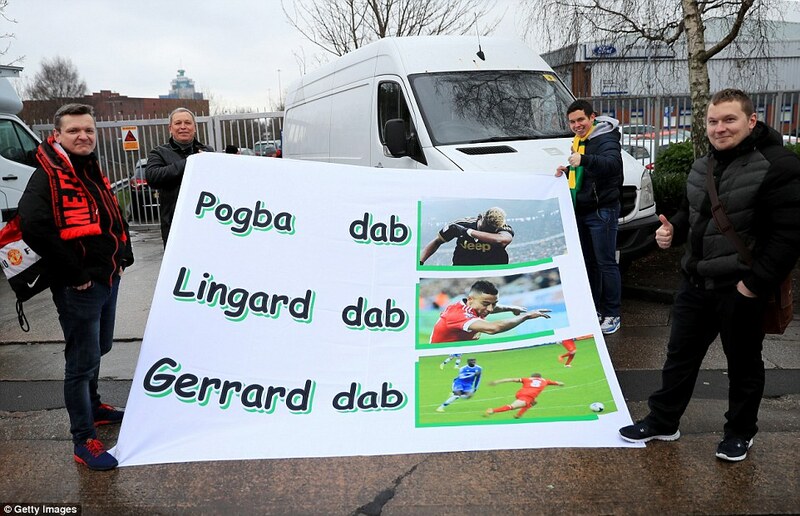 And maybe, just maybe, Martial is starting to get the message. The young Frenchman has been the source of much frustration for his manager. 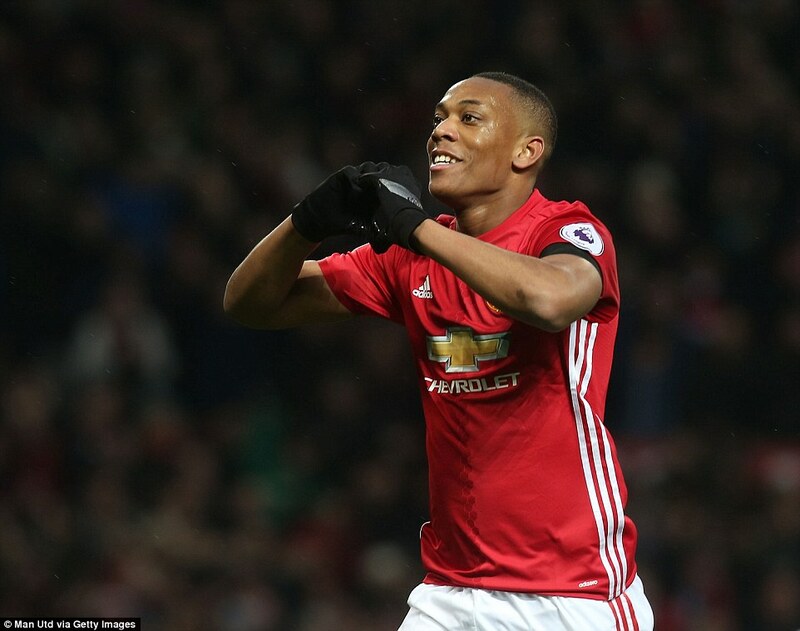 Mourinho has challenged Martial to make the most of his first-team opportunities and then rebuked him for not doing so. The man who could end up costing United £58million has endured a difficult second season after such a bright start at Old Trafford. 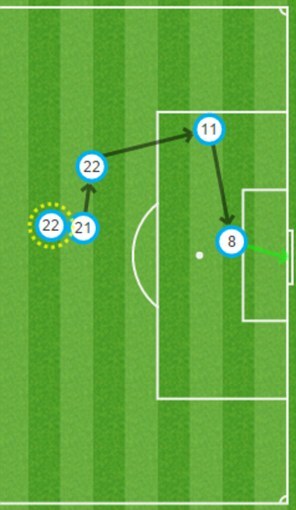 The move for Juan Mata’s opening goal for Manchester United. 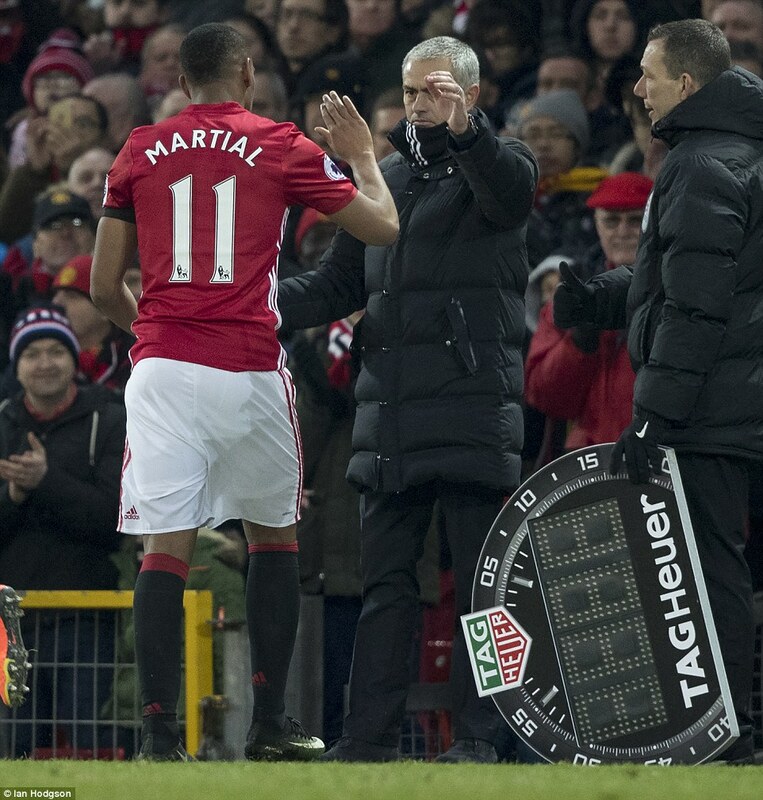 Martial has been benched and, at times, left out altogether. 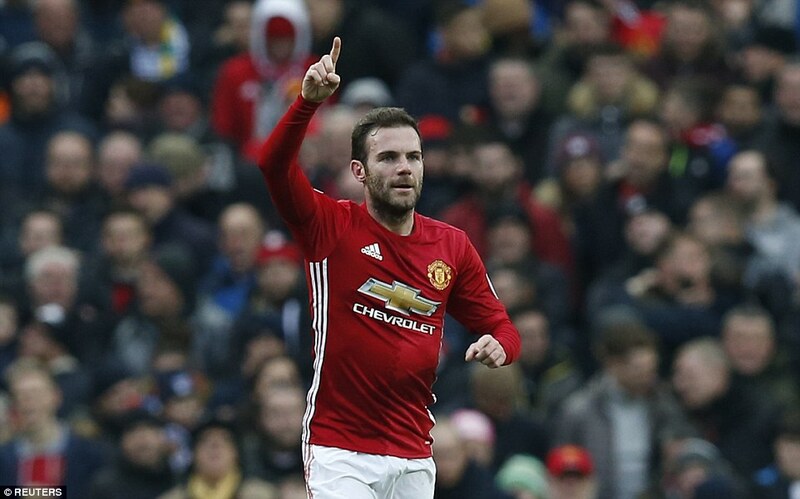 Here, he was a surprise starter and justified Mourinho’s decision with a man of the match performance, helping create the first goal for Juan Mata and scoring that second himself. 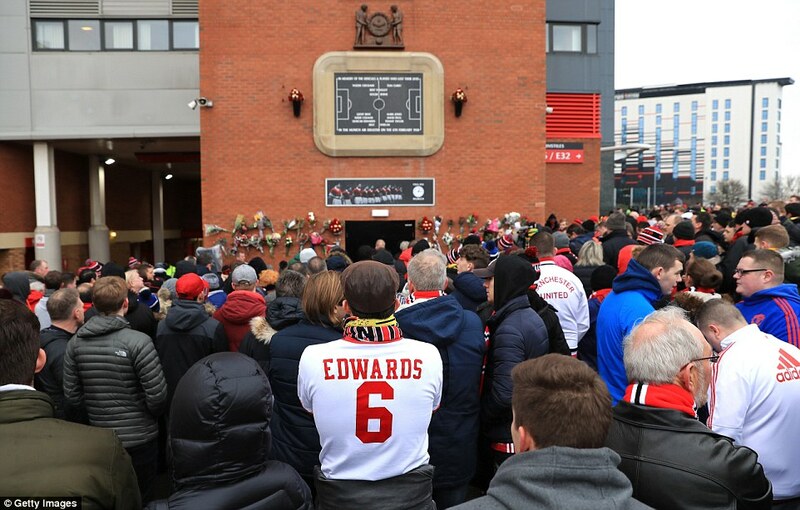 For half an hour it was a painfully familiar story for United, however. 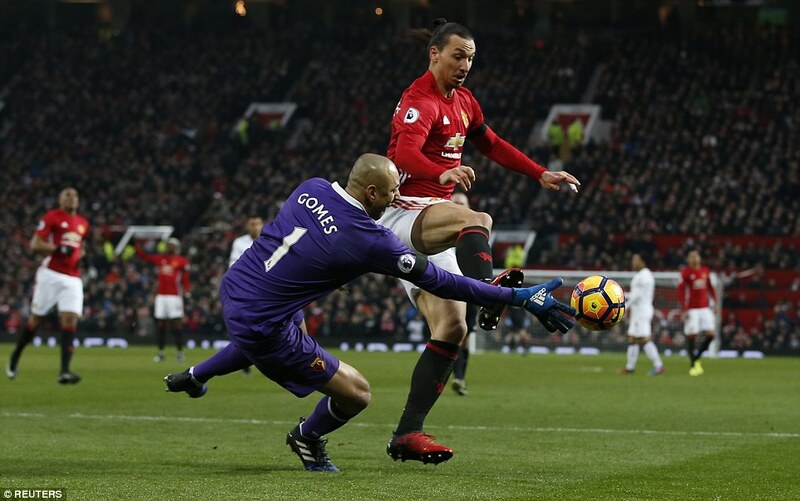 Mourinho has bemoaned United’s finishing in nine league draws this season against the likes of Stoke, Burnley, West Ham and Hull – as well as some outstanding goalkeeping performances – and this game was going the same way with Heurelho Gomes on top form. 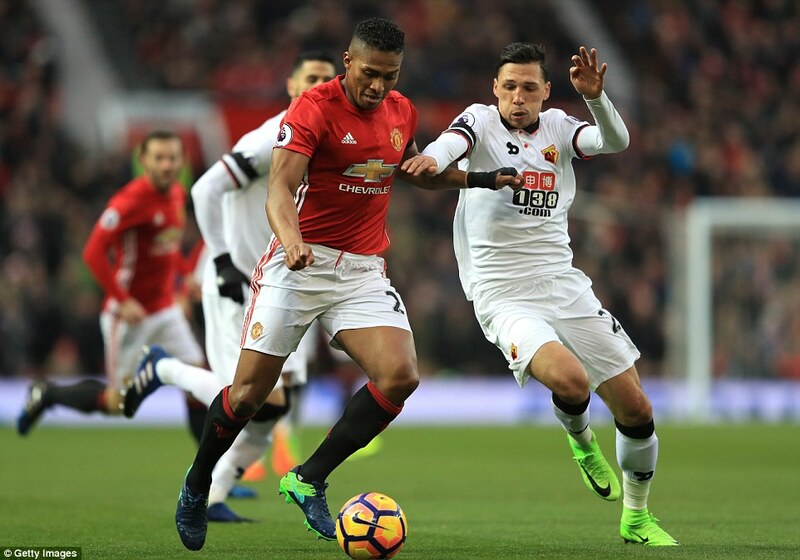 But in the end Watford simply had no answer to United’s attacking power as Mourinho’s side got around them with Martial on the left and Antonio Valencia on the right. 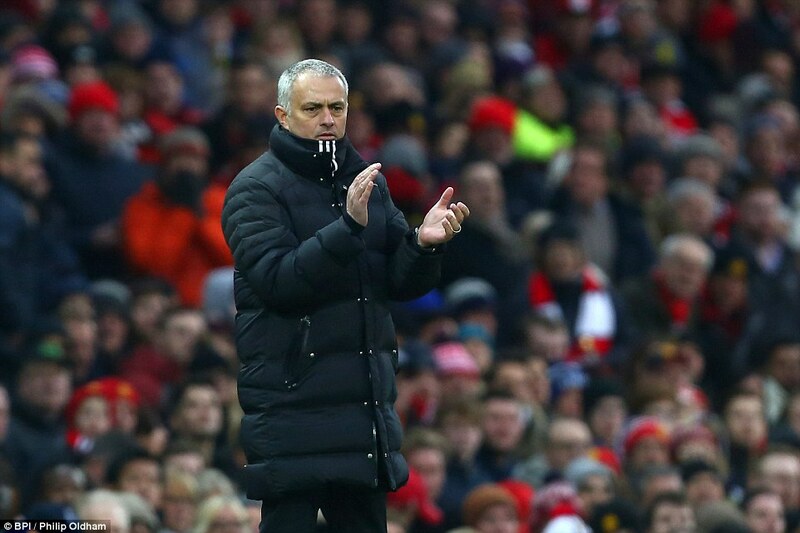 It should have produced more goals but Mourinho will just be thankful for the three points to maintain United’s challenge for a top-four finish before they break off for four games in the cup competitions, starting with Thursday’s Europa League tie against St Etienne at Old Trafford. 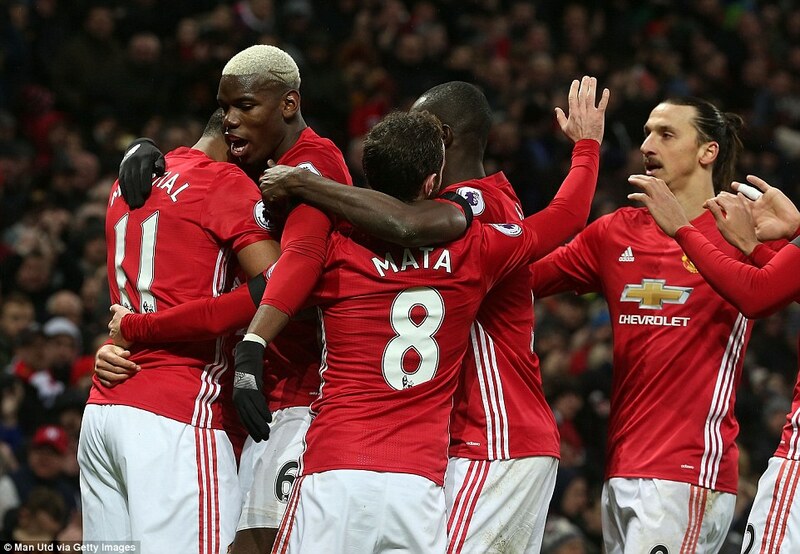 As costly as those draws have been, United still came into the game on a 15-match unbeaten run in the league since losing at Chelsea in October. 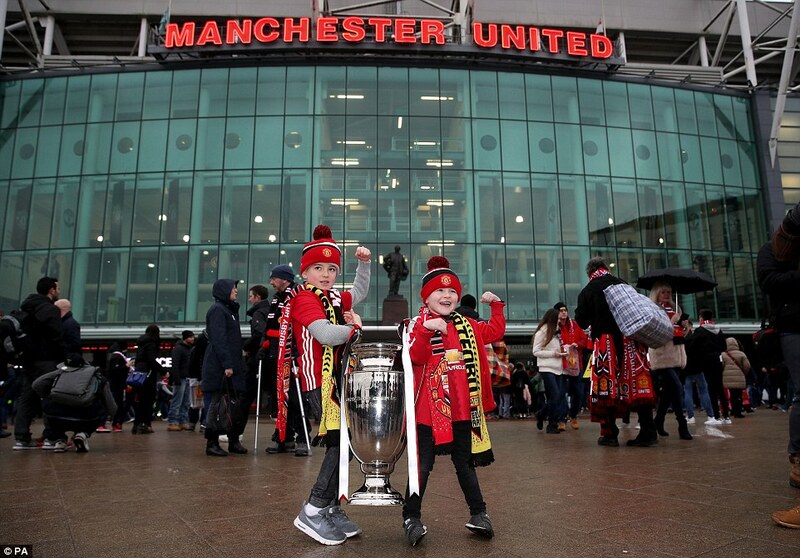 However, Mourinho did not need reminding that United were well beaten 3-1 by Vicarage Road in September, the last of three defeats in the space of a week that plunged him into the first crisis of his time in charge at Old Trafford. 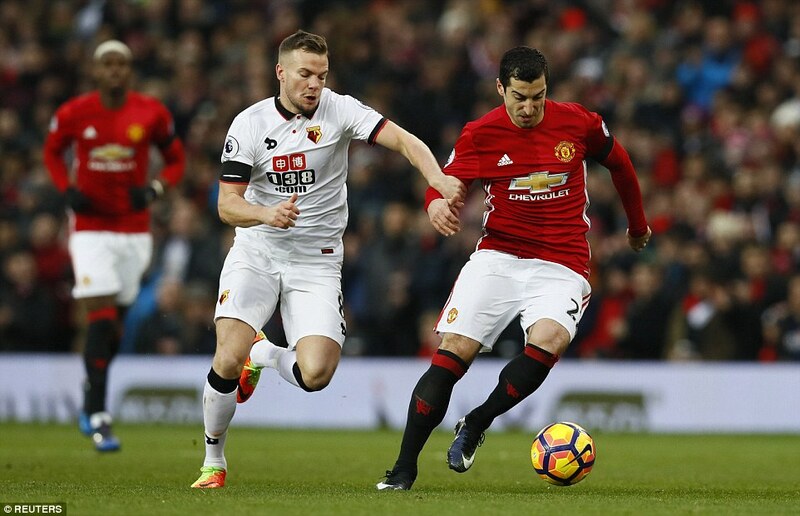 Those were Watford’s first Premier League points against United, and the fact that Walter Mazzarri’s side arrived in the north-west looking for their third straight league win was an indication of the threat they posed. 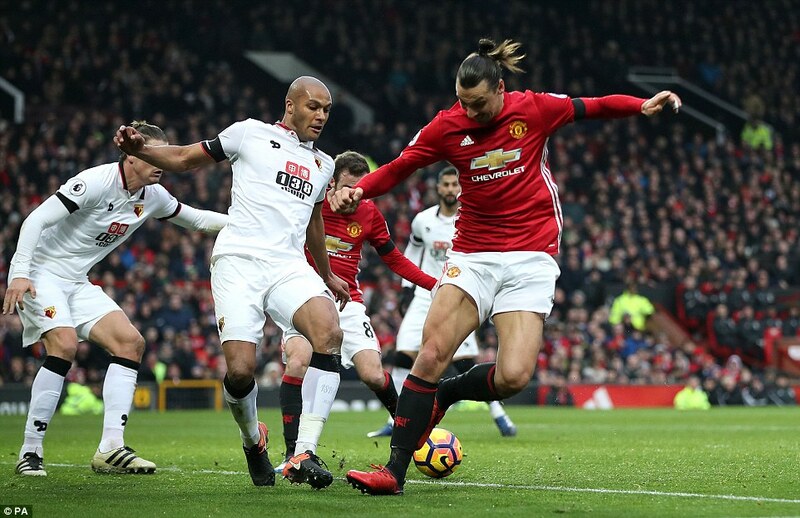 There was little opportunity for the visitors to demonstrate it in a first half dominated by United which should have produced more than one goal by the interval. 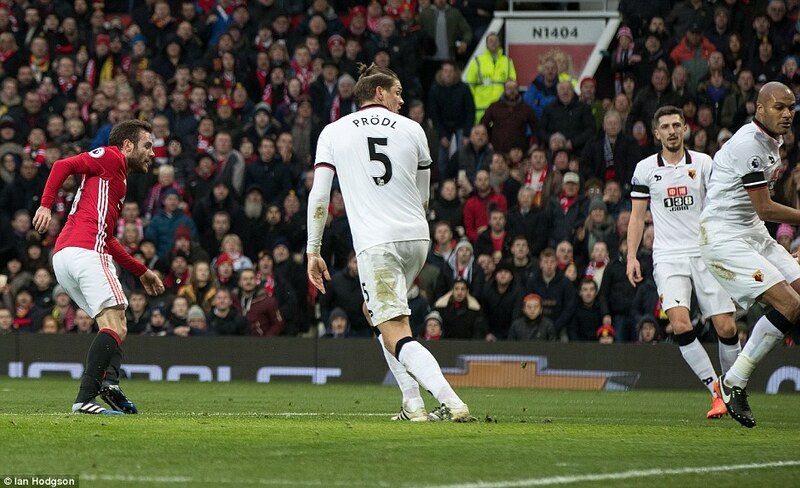 The game was little more than two minutes old when Mata’s lovely flick released Valencia down the right. 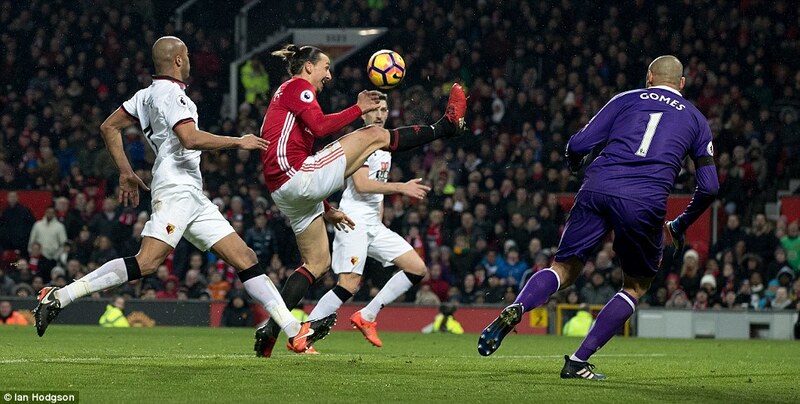 The Ecuadorian’s cross was deflected up in the air and fell invitingly for Zlatan Ibrahimovic who fluffed his volley. 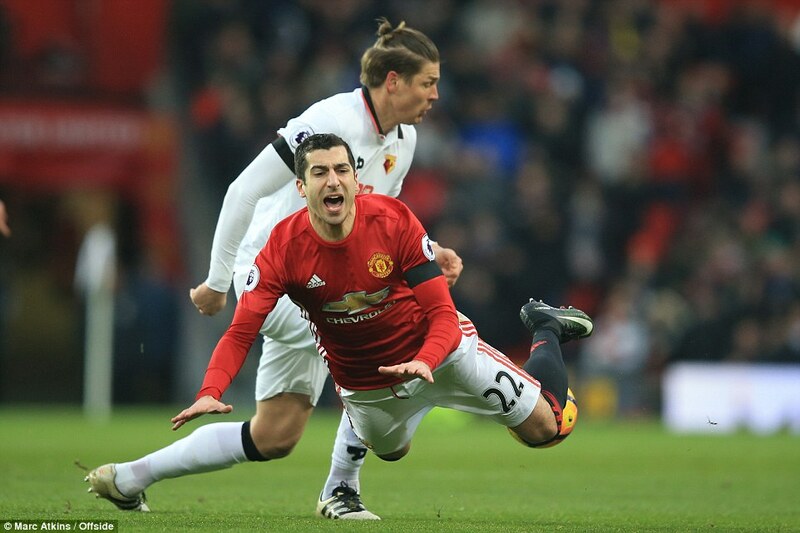 Henrikh Mkhitaryan, once again proving highly effective in a more central No 10 role, was next to try his luck as he rifled a low shot that Gomes just held onto. 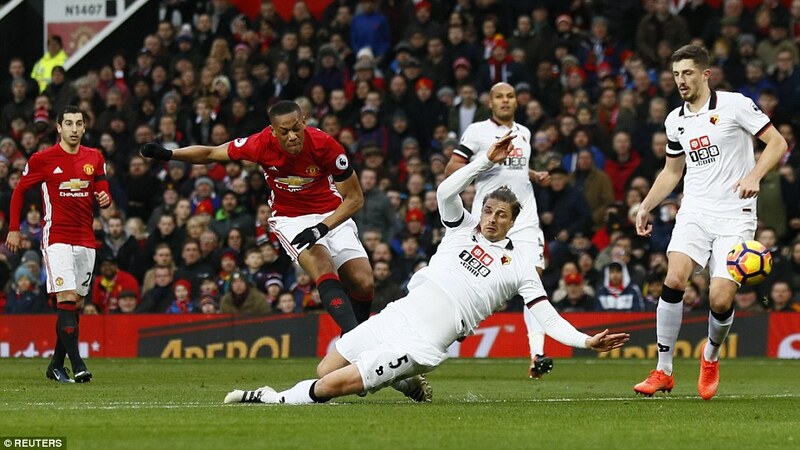 Martial certainly looked to have taken Mourinho’s message on board and he almost broke the deadlock with a wonderful piece of footwork, breezing past former United duo Craig Cathcart and Tom Cleverley as he cut inside from the left. 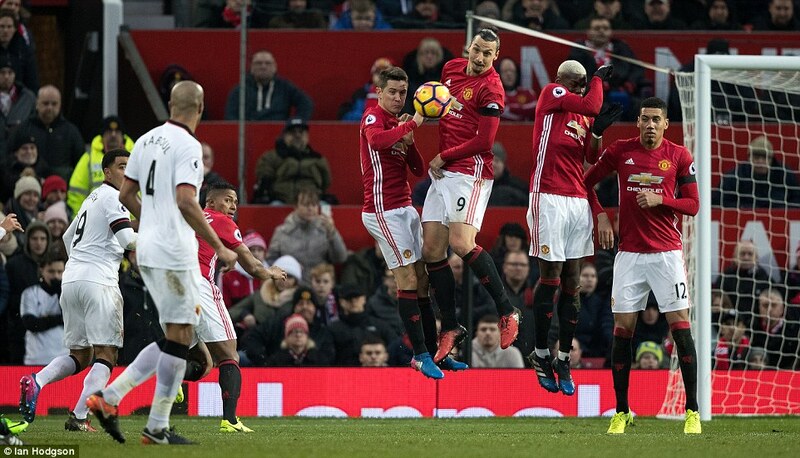 Sebastian Prodl managed to block Martial’s shot but the ball reared up over a stranded Gomes and looped just wide. 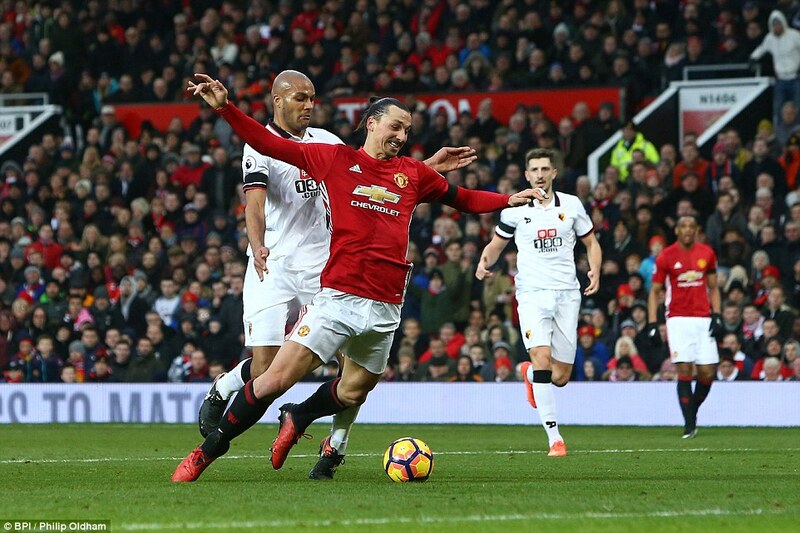 United thought they had taken the lead in the 16th minute when Ibrahimovic was fouled and a quickly-taken freekick gave Mata the chance to tap home, but referee Bobby Madley ordered it to be retaken. 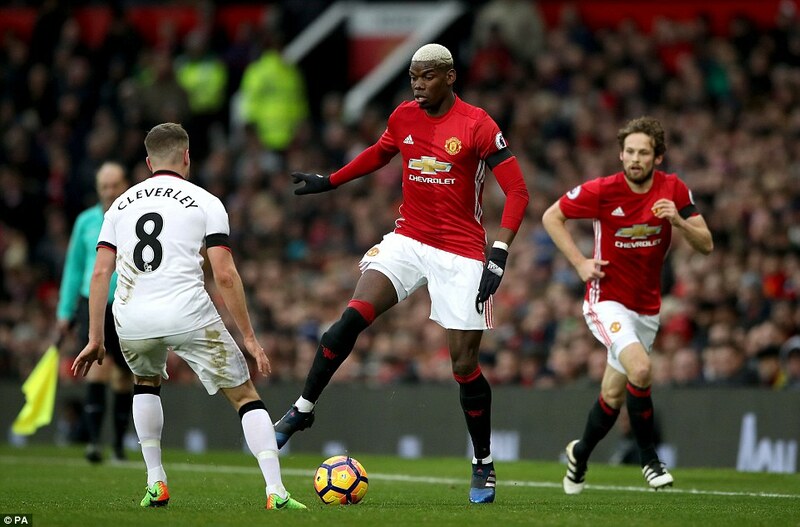 Gomes then produced an excellent save to claw away Pogba’s 30-yard drive before the Frenchman created another chance for Ibrahimovic by floating a pass into his teammate who had timed his run into the box to perfection. The Swede controlled the ball on his chest and swivelled to shoot, but sent it high into the East Stand. 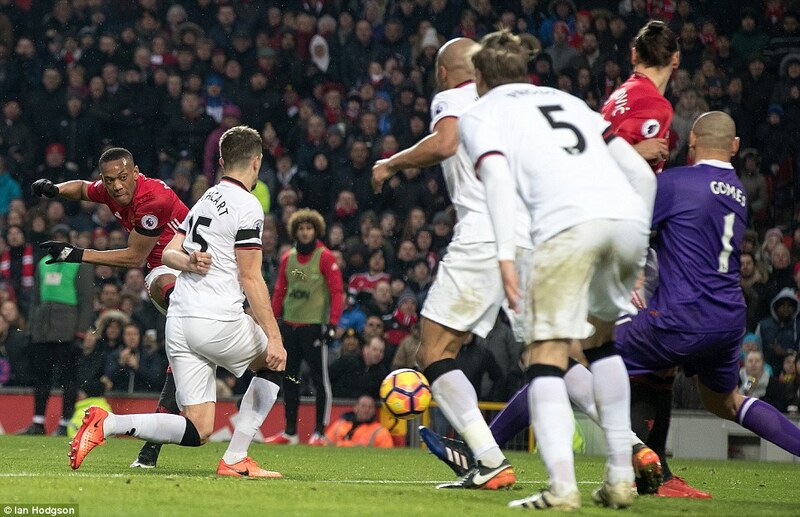 United were attacking at will, and moments later it was Pogba with a clear sight of goal when Valencia picked out his run with a cross to the penalty spot. The Frenchman’s first-time effort was good enough but once again Gomes was equal to it. 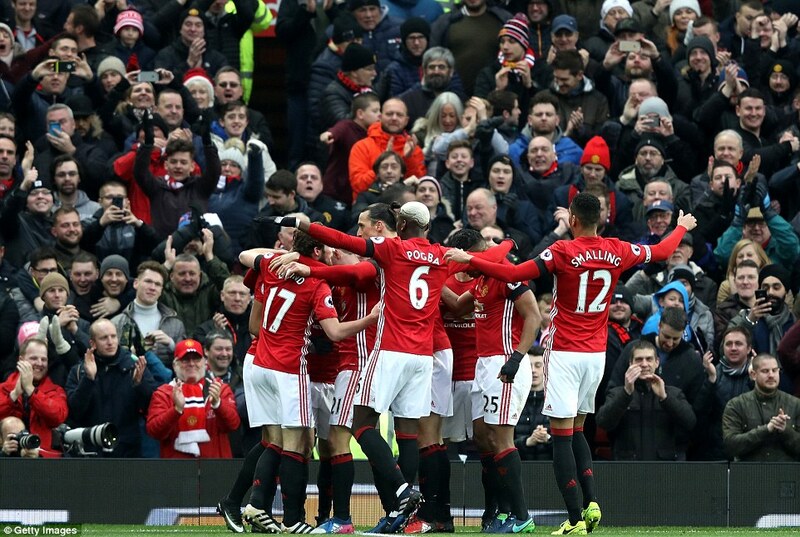 United stepped up the pace again and it produced three clear chances in as many minutes around the half-hour mark. 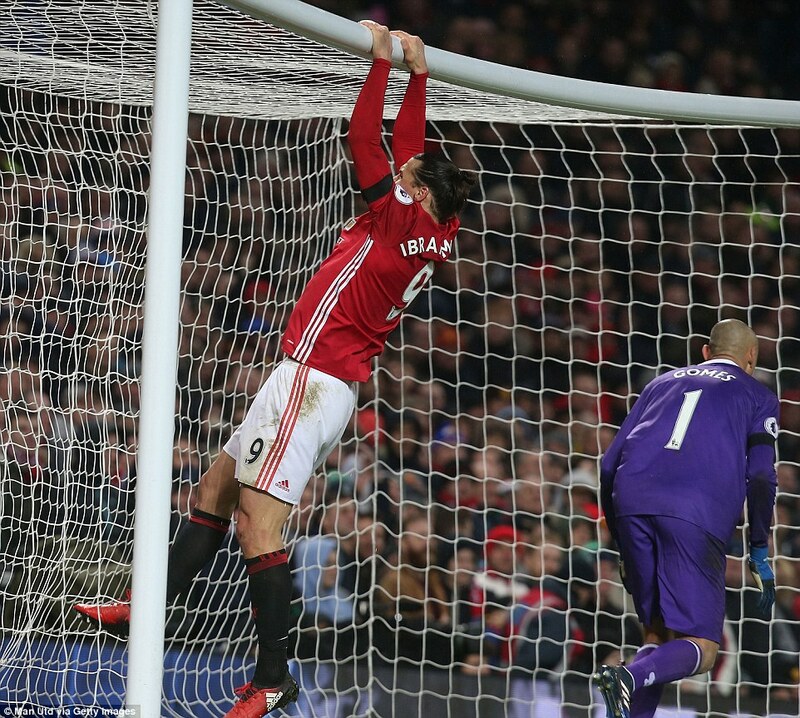 First, Mata pulled the ball back for Mkhitaryan whose attempt would not have been out of place in the Wales-England game in Cardiff as it flew high into the stands just like Ibrahimovic’s effort before it. 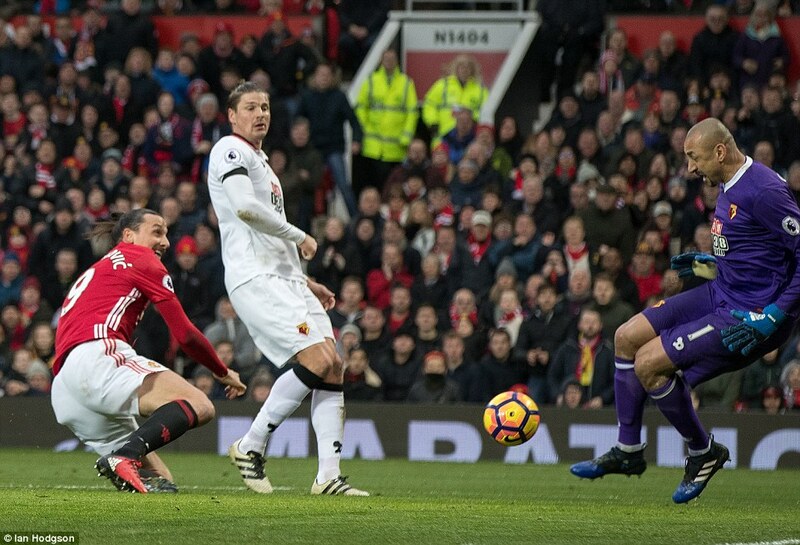 Mata then clipped in another cross to the edge of the six-yard box where Ibrahimovic’s header brought an outstanding reflex save from Gomes. And it was the little Spaniard who finally beat Watford’s Brazilian goalkeeper in the 32nd minute. Mata helped start the move, playing a one-two with Mkhitarayan who slid the ball wide to Martial. 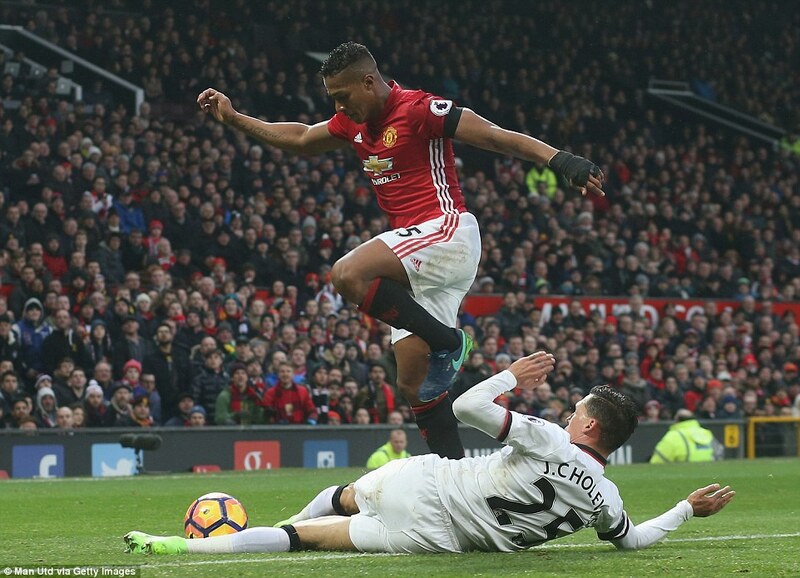 He steered it across goal where Ibrahimovic dummied and Mata guided the ball neatly in with the inside of his left boot. 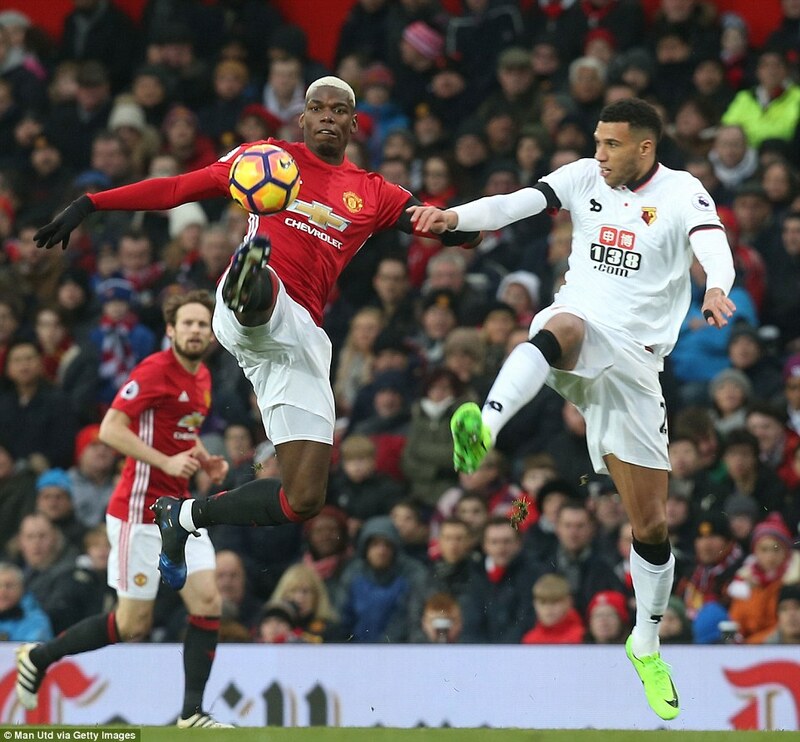 Up to that point Watford’s only real threat had been an outswinging shot from Jose Holebas which beat David de Gea and might have crept in had it been swerving the other way. 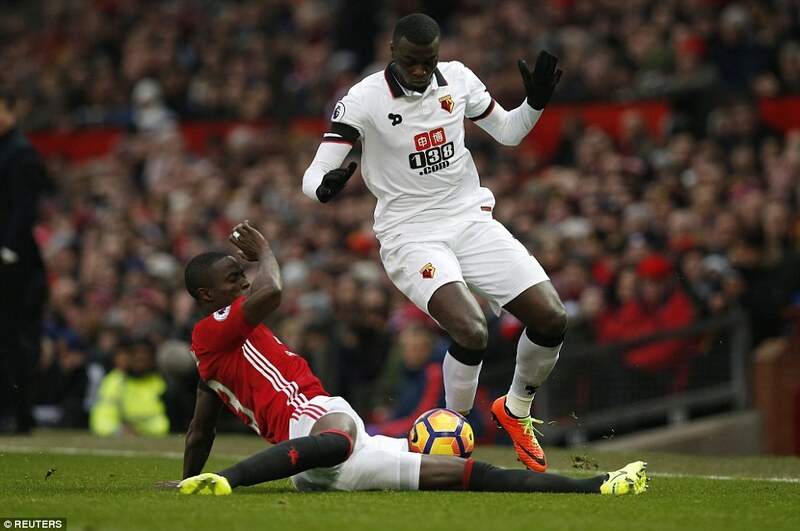 The visitors also had a penalty claim rejected just before half-time for Chris Smalling’s challenge on Etienne Capoue. But they went close to an equaliser eight minutes after the restart when Mauro Zarate’s 25-yard freekick brought a fine one-handed save from De Gea, his first of the match. 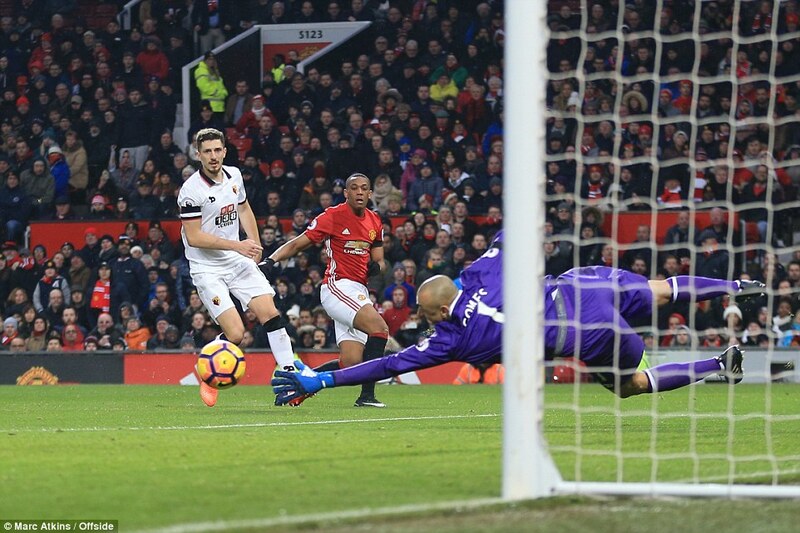 That proved to be Watford’s big opportunity because Martial killed the game off with a second goal on the hour. 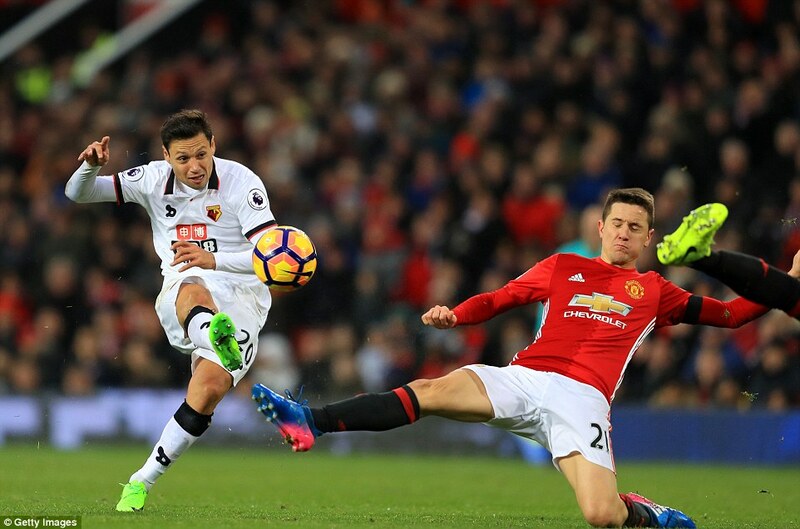 Ander Herrera won back possession midway inside the opposition half and fed Pogba. 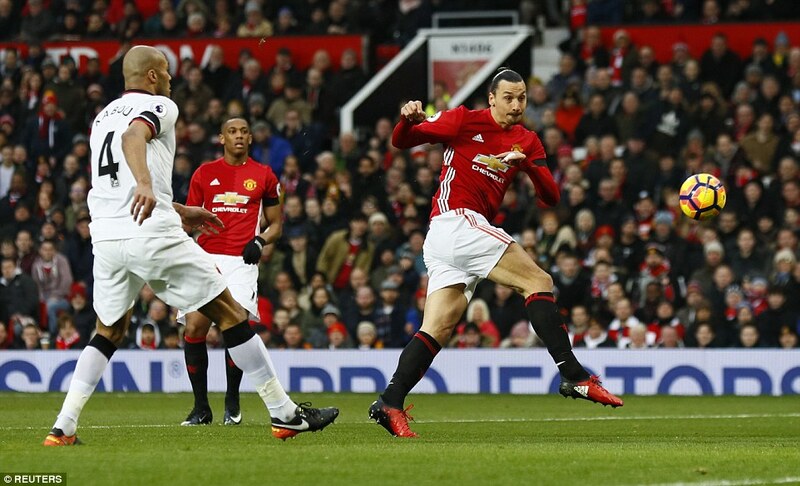 The ball was transferred quickly between Mkihitaryan and Ibrahimovic to Martial who advanced on goal and looked like he was going to cross before cleverly drilling a shot just inside Gomes’ near post. Watford still weren’t ready to lie down, however, and produced their best spell of the game. 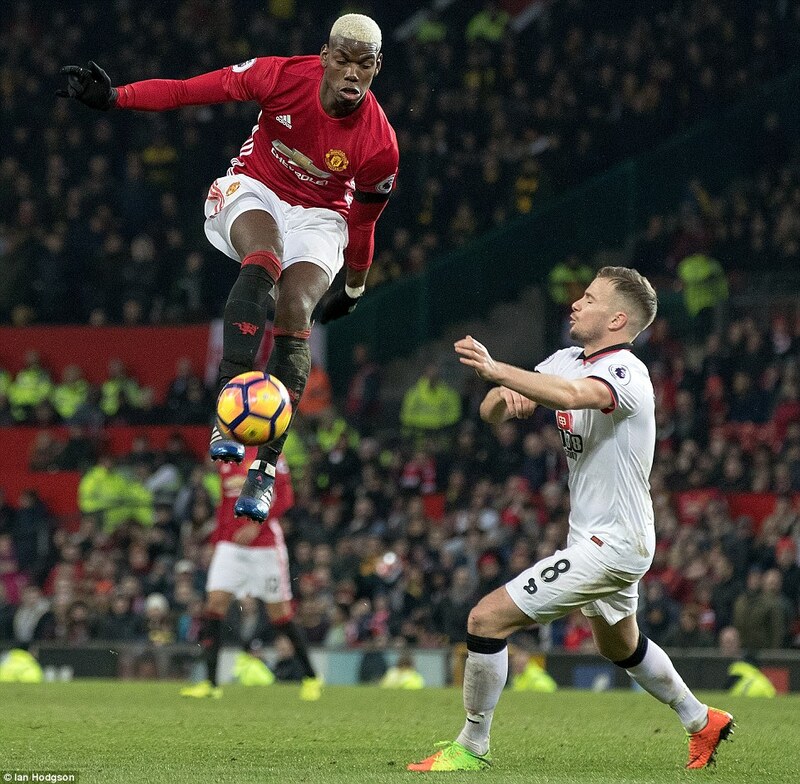 In the 70th minute M’Baye Niang powered past Daley Blind down the right and swung the ball to the edge of the edge of the six-yard box where substitute Daryl Janmaat became the third player to balloon a shot into the East Stand. 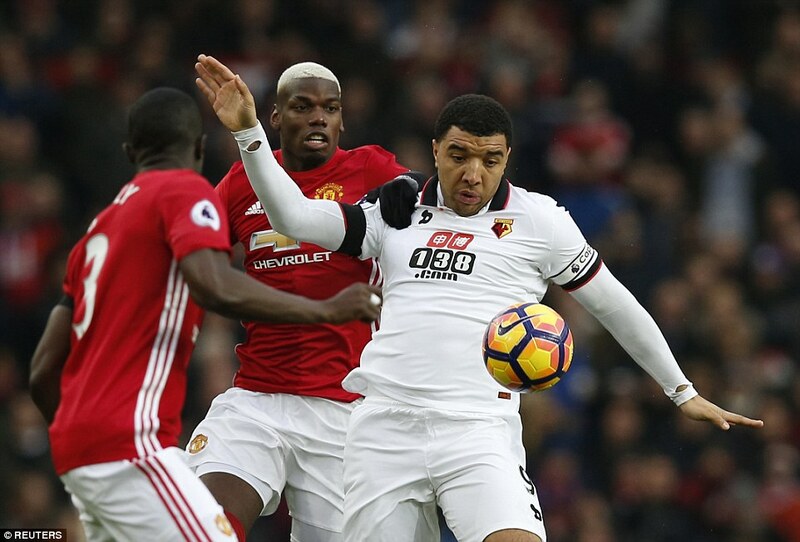 Troy Deeney then shrugged off Smalling’s challenge to test De Gea with a fierce effort which the United keeper could only beat away. 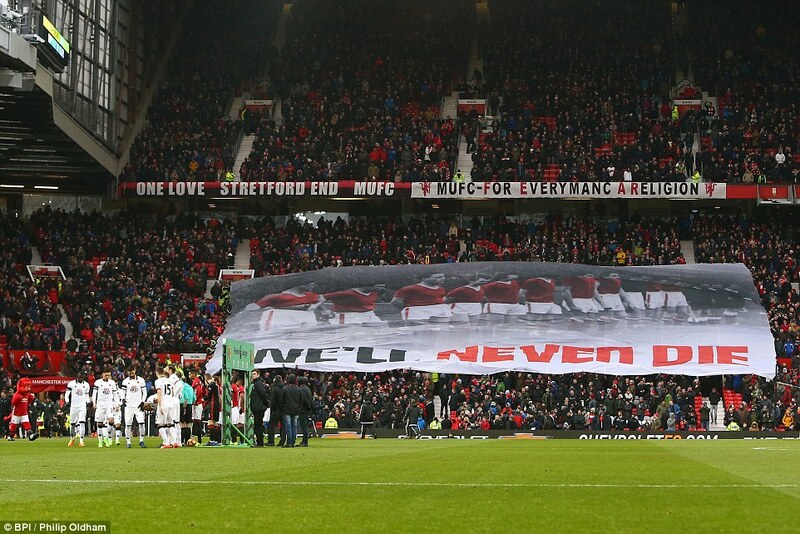 But United had this sewn up, Martial had helped see to that. Mourinho can only hope the talented Frenchman kicks on from here.